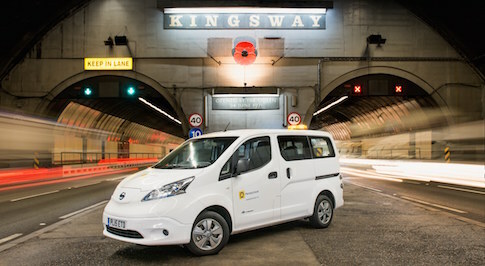 Nissan's all-electric van, the e-NV200 has been put to a good use after being drafted onto the Merseytravel fleet. The local transport executive for Liverpool has added three of the e-NV200 Combi vans to its fleet of 40 vehicles. They will be used primarily to transport workers and their tools around the Merseytravel estate between the various bus stations, three ferry terminals, seven tunnel ventilation stations and the two Mersey road tunnels: the Queensway and Kingsway. The e-NV200s will join a Nissan LEAF already in the fleet, which was taken on last year by Merseytravel as one of the company's pool cars. In using the electric cars, the company will substantially reduce its fuel costs, whilst also helping to improve the local air quality. Councillor Liam Robinson, Chair of Merseytravel, commented: "Our vision is for electric and other low emission vehicles to play a role in developing a vibrant low carbon economy across the region. "The introduction of more electric vehicles to our own fleet is another major step forward."